PH is open-shelter to Rohingya, Duterte says "They are welcome." "I really pity the people there. I'm willing to accept refugees. 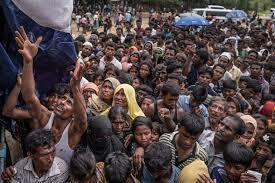 Rohingyas, yes. I will help but we should split them with Europe." President Rodrigo Duterte said, referring to Rohingya fled from the bloody genocide in Mynamar. Due to open door policy, the Palace disclosed that the administration is willing to accept exodus of Rohingya to seek shelter in PH.